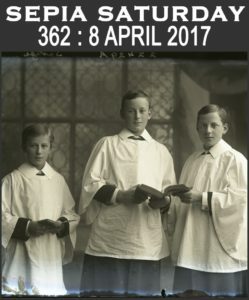 Today’s inspirational Sepia Saturday image is of three fresh faced choir boys. I know I have similar images of real choir or altar boys in my collection but I couldn’t get past these alternative and far less attractive ‘choir boys’. They are dolls made by one of my grandparent’s children, probably in the late 1940s or early 1950s. More correctly they are decorated paper cones with a doll’s head glued on. During my childhood they were kept in a glass cabinet in the living room of my grandparents’ home. I was allowed to take them out and play with them and always carefully and gently placed them back in their spot. When my grandmother downsized from her home of almost 60 years, she gave the dolls to me. Time and the effects of grandchildren have taken their toll, and their paper doily overskirts and collars are now in serious disarray. The sticky tape that held on the head of the one on the right has long since perished, making him sometimes look like a headless horseman. The one on the left has a head of large proportions compared to his body and sometimes his closing eyes don’t quite close, making him look a bit macabre. Nevertheless they remind me of a quiet and gentle time I had playing in that warm comforting room in front of the wood fire with my grandparents, and I treasure them for those memories that they evoke. 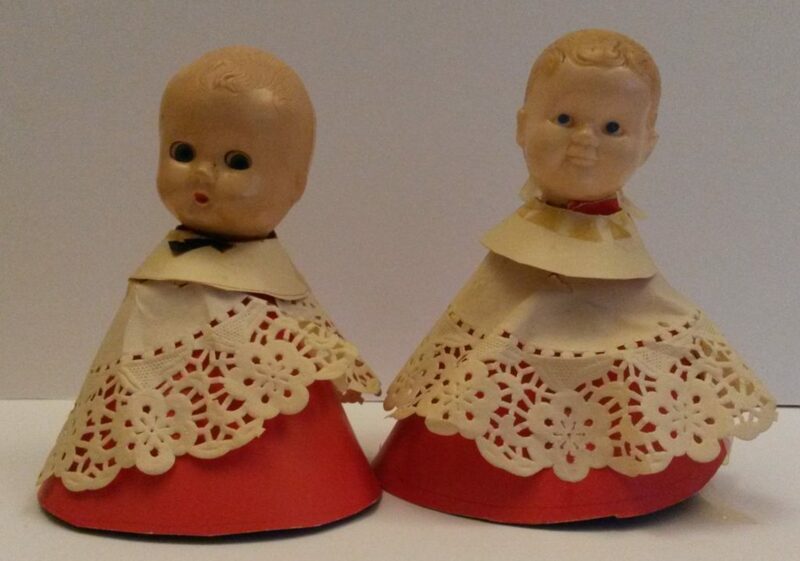 Choir or altar boy dolls, circa late 1940s. Why don’t you pop over to Sepia Saturday and see how other bloggers have interpreted the choir boys?